Every weekend in the summer, people swarm to the Lake District’s myriad attractions. The campsites book up months in advance, spilling over with families, barbeques and guy ropes; crossing the field to join a toilet queue becomes an SAS-style mission. Fortunately for those who prefer to watch the sun set without a Frisbee flying across it, there are endless opportunities for wild camping – pitching your tent in the wilderness, miles from anyone else. A long weekend away was also an opportunity to think through an idea for a new walking website. Whilst a few guidebooks and walking magazines now mention how to get to a route by bus or train, the nearest car park is still what most walkers look for. I wanted to create a website where people could share walks in the UK that could be reached by public transport. A few nights alone in the quietest corners of the Lakes would be the perfect opportunity to think through ideas, work out a plan and, most importantly, think up a name. After booking some very cheap train tickets from London to Windermere and packing a brand new Terra Nova tent into a well-worn backpack, I head north. I time my arrival in Windermere at late afternoon, when most walkers are trudging down from the summits. This is a well-known wild camping trick; just 30 minutes later on Orrest Head (an easy 238m ascent), there is no one to disturb the views across Windermere and the golds and russets of the fells provide the perfect backdrop for people enjoying England’s largest natural lake from their rowing boats. Heading deeper into Troutbeck Valley along the Garburn track, the trickle of evening walkers dries up completely. 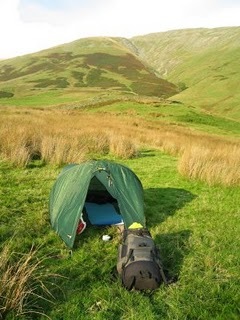 As dusk settles, I pitch my brand new tent on the grassy flanks of Ill Bell alone – the Lake District to myself at last. Some inquisitive sheep wander over to see what’s happening, unused to intruders disturbing their peace at this time of day. The setting sun sends soft purple shadows across the silent valley, and the scent of wild grass and bracken just overpowers the smell of damp boots. By 7am the next morning, I’m heading north towards Stony Cove Pike. The plan is to head towards Helvellyn and wild camp near Red Tarn. Three glorious hours pass before meeting the first walker of the day. He issues a cheery “good morning”, displaying the bonhomie that flourishes between walkers in Britain’s mountains. By mid morning, the crowds are out in force, jockeying for position around the famous Fairfield horseshoe. And ever more they come; on Helvellyn, after the 200th “hello” of the day, my good spirits are in dangerously short supply – the solitude of a wild camp can’t come soon enough. ‘Closing Time’ syndrome strikes again as the sun goes down, and the fells are soon deserted apart from a few stragglers carefully descending Swirral Edge. Dark clouds are gathering, though, and neither my new tent nor tired limbs fancy a cold, soggy night on higher ground, so I head into Grisedale Valley to look for shelter. Some hope. As the winds pick up and the clouds explode, the tent starts playing games – there hadn’t been this many poles last night, surely? But 10 minutes later, the stove is bubbling and the boots are off. I sit in the small porch to watch the storm unleash its fury on Patterdale and Ullswater. And there’s no better way to enjoy the Lake District than sheltered by canvas with a whole valley to yourself, whether it’s lit up by lightning or a sunset. Next morning, the inclement weather means an early start (the rain started at 5am) and a head-down, hood-up quick march back over Fairfield and into Ambleside, where warm pubs and foodstuffs other than cereal bars await me. Refreshed, it’s a short stroll for the final night’s camping – this time in the relative comfort of the campsite behind Rydal Hall.